TP Mazembe of the Democratic Republic of Congo crushed Tunisia's Club Africain 8-0 on Saturday to achieve a record winning margin for an African Champions League group match. The five-time African champions overtook the mark set 18 years ago by Ivory Coast's ASEC Mimosas when they beat CR Belouizdad of Algeria 7-0. Moroccan club Difaa el Jadida hold the record for a single-match winning margin at any stage of the Champions League after a 10-0 win over Benfica of Guinea-Bissau last season. Mazembe ran riot in Lubumbashi just 14 days after suffering a three-goal defeat away to surprise Group C pacesetters CS Constantine of Algeria. Constantine top the table with six points, Mazembe have three and Club Africain none in a group reduced to three clubs after Ismaily of Egypt were disqualified for crowd violence. If Mazembe avoid defeat away to former champions Club Africain in Tunis on 12 February, they and Constantine will secure quarter-finals places in the elite African club competition. 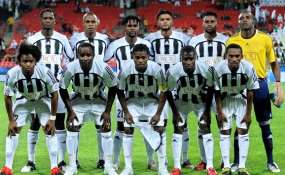 Mazembe are among the favourites to win the Champions League this season along with holders Esperance of Tunisia, Al Ahly of Egypt and Wydad Casablanca of Morocco. Wydad became the first team to win away in Group A with a first-half penalty converted by Mohamed Nahiri earning a 1-0 victory over lacklustre Lobi Stars of Nigeria in Enugu.